Right now you are probably working on some particular project, and asking yourself what kind of wood stain to use. Otherwise, you probably wouldn’t be reading this article in the first place. It might seem like a simple decision, but it is actually nothing of the sort. There are quite a few different kinds of wood stain out there, and no two are exactly alike. 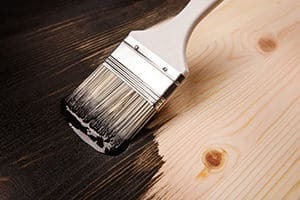 While most stains will serve to beautify your wood and bring out its natural grain and texture, a little knowledge will help you to make it look even better. Staining serves a lot of purposes, but most of it comes down to cosmetics. While staining will provide a certain amount of resistance against rot, insects, etc., it will do very little other than to beautify the wood. This is why you don’t always need to stain your woodwork, as some projects do not require an attractive look. For instance, if you are building a house for chickens, dogs, or other animals, staining would be kind of pointless. In these cases using a sealer to protect the wood would be a more appropriate solution. If you can’t decide whether to use stain or sealer I suggest you find out when you need to seal or stain the wood. Wood stain products come in a much larger variety than most would guess. It may seem like a simple product, and in some ways it is. Staining is a simple principle that can be applied in many ways. These stains work by using a simple pigment such as those normally found in paints. Pigment stains are available in water, oil, and solvent bases. They are also sometimes sold as powdered substances that need to be mixed with one of these liquids. These are by far the most common types of stain on the market, as they are the easiest to apply and the least costly. These types of stains are made up of relatively large particles that do not deeply penetrate the wood. Because of this, pigment dyes do a great job of bringing out the surface texture but do nothing to bring out the inner grain. These stains are based on aniline dyes, which are much stronger in terms of their coloring power. Dye-based stains will penetrate the wood more deeply and bring out the inner grain and texture of the wood, contrasting with the surface texture. Some extremely beautiful finishes can be created with this method, but it is much more difficult to get it right. Using this kind of dye requires a higher degree of skill, which is why these dyes are used mainly for special-purpose items. Wood stains are also separated by their opacity. If you don’t know what this word means, it simply denotes the level of darkening that is achieved. 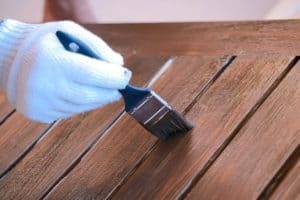 The purpose of staining is to color the surface of wood without covering up the natural grain, but there is a question of how visible you want the grain to be. As a result, stains are separated into transparent, semi-transparent, solid, and semi-solid categories. The transparent and semi-transparent stains are lighter in both coloration and thickness, allowing you to simply “tone” the wood rather than fully coloring it. For this reason, light stains are often referred to as “toner.” The solid and semi-solid stains will cause the wood grain to be less visible. It is recommended to experiment with pieces of scrap wood to get an idea of the differences between the different opacity levels. Since there are literally thousands if not millions of different things that can be made of wood, there is no way to create a set of rules that will cover everything. 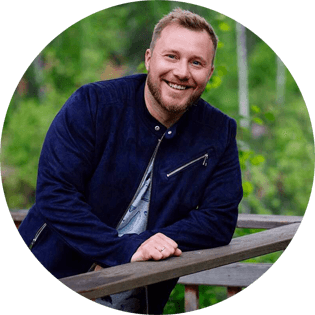 Instead, we will present a series of examples, telling which kind (or kinds) of stain would be best and why they would be preferred over others. This is probably a small-scale project unless you are making one of those huge standing bass instruments. Chances are, there is not a whole lot of wood involved here. Also, this is an item that is likely to sell for a high price and is also likely to be treasured very highly. As such, beauty is more important than convenience for this project. Use a dye-based stain in a rich and vibrant color and give that instrument a finish that is worthy of a work of art. Obviously, this is not strictly a woodworking project, as you will have to deal with the upholstery and quite a few springs. Nevertheless, the frame is still made of wood, so we will assume that you are replacing the wooden frame of an existing couch. For this project, staining will only be necessary for wooden parts that will be visible. Anything that will remain covered by cloth should be left alone. As for the visible areas, this is largely a matter of how much you want to put into it. A simple semi-transparent pigment stain would be the standard choice, though a dye-based stain could be used if you really want to go all-out. Obviously, this project will be made entirely of wood (unless you count the nails, screws, and brackets that hold it together). A kitchen table needs to look nice, as it will be very visible to anyone who sits down to eat a meal. Not only do you want to impress your guests, but you also want the satisfaction of knowing you created something beautiful. For this, I would say that your choice of stain should reflect the type of wood of which your table is made. Lighter, paler woods like pine or maple are perfect choices for brightly-colored dye stains. The lighter surface will allow the color and grain to show up much better. For darker-colored woods, A transparent pigment is a good option. You have a number of options here. A barn, being a place for animals, does not require any special decoration. However, people have been decorating barns for many, many years and there’s no reason to stop now. Instead of going with the standard red-painted barn with white trim, you can instead opt for a more natural look and stain the outside to one extent or another. How far should you go? This is an important question because it would be ridiculous to stain the entire barn. Chances are, this is a large building. Who can afford to waste this stuff? Even if it isn’t terribly expensive? Don’t go crazy and try to stain every inch. Instead, just stain the surfaces which are visible from your house. This way, you will have a good-looking barn that isn’t an eyesore, but you won’t have to spend a fortune on stain. You can further cut down on the surface area by adding decorations to the barn, as many people choose to do. Obviously, you don’t need to worry about staining the inside of the barn at all. As for which type to use, do not even try to use a dye stain for this one. You’ll go broke and likely lose your mind. Go with a solid or semi-solid pigment stain, for a good color that pops out from far away. When you want to make a good first impression on your guests, it is a fine idea to think about your front porch. After all, this is the first thing that a person will see as they walk up to your door. They are also likely to look around as they wait for an answer. When they look down at their feet, you want them to see a beautiful surface staring back up at them. It should be noted that you could just use a clear finish, so as to maintain the natural look of the wood, but that’s kind of boring if you ask me. As with the barn, this project is probably too big to use a dye-based product. I would recommend a transparent or semi-transparent toner in a rich, dark tone. Remember, people will be walking on this every day, so don’t use a light color that will show every scratch and nick that is created. A darker color will hide those small scuff marks, minor scratches, and other imperfections more effectively. An ugly floor can ruin the look of your entire house, so don’t take this one lightly. It is very important to take your time and do it correctly. As with our previous example (patio decks), darker colors are preferred. If you really want a lighter-colored finish, I would recommend using it in a low-traffic area so that it won’t suffer so much wear and tear. You could also use a thick coat of sealant to protect it. However, it’s easier to go with a dark finish in the first place. I recommend a transparent or semi-transparent product so that a person won’t have to stoop down to admire the natural pattern. I would recommend against the use of an oil-based stain for this project. This is because an oil-based stain has to be wiped away (once it has done its work, of course). This can be a real pain to do on a hardwood floor, as the many tiny cracks between the boards can give the oil a place to collect. To get it out will require scraping, which then presents a risk of damaging your nice new finish. Save yourself some trouble and use a water-based version. Borders and trim are pretty much wide open. These are useless pieces of wood that serve no structural purpose. Since borders and trim are purely cosmetic, you can pretty much go any way you want. Your only real limit would be the need to match the tones of your home. Expensive dye stains would really bring a touch of class to your trim, but considering how likely this wood is to be broken and discarded at some point, the high-class dyed finish is probably more trouble than it’s worth. When deciding which type of wood stain you should use, you can see that your choice is not an easy one. Your variables will include the type of wood being used, the transparency or opacity of the finish, how thickly it will be applied, How much wear and tear you expect the wood to receive, and the basic type of stain being used. While this may seem intimidating, it is far more encouraging to think of this as an opportunity to use your creativity. When you look at it this way, the whole thing becomes an art project, and we all know that art class is always the easiest class!